Nothing says how much you care than a homemade present at Christmas! 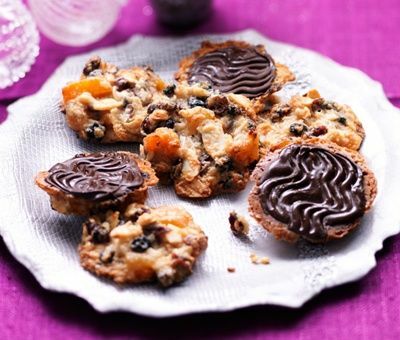 And these mixed fruit and nut Florentines are so quick and easy. Pop them in a cellophane bag with some ribbon to make them look really professional. 150g mixed dried fruit and nuts such as apricots, cranberries, toasted flaked almonds, desiccated coconut etc. 1. Preheat the oven to 180°C, (160°C for fan ovens) or Gas Mark 4. 2. Melt the butter and sugar in a non-stick saucepan. Add the condensed milk and heat until just bubbling, stirring all the time. Stir in the plain flour and mix until smooth. Add the dried fruit and nuts and mix well. 3. Place teaspoonfuls of the mixture onto parchment lined baking sheets and bake for about 12 minutes until turning golden brown at the edges. Leave to cool on the tray. 4. When cool, melt the chocolate then let it cool until it becomes thick and spreadable. Spread each biscuit with chocolate on the flat side and then drag a fork through the chocolate to make wavy lines. Dark chocolate works really well but use a selection of different chocolates if you like. Try spiced orange or milk or Nestle Milkybar! Very easy to make although I think I left mine in the oven a little too long as they were a bit on the hard side. Will make sure it doesn't happen next time. They would make a super present as they look very professional and the recipient will think you've spent ages making them! How long do these keep?? I want to make them for Christmas, but don't want to have to do everything at the same time! Hi LazuliButterfly, Florentines are such a treat! If kept in an airtight container these little morsels will last a couple of weeks. Perfect as a gift! Florentines is rated 5.0 out of 5 by 1. Rated 5 out of 5 by Julia from Delicious Delicious receipe,easy, where you can choose to add your favourite ingredients eg cherries, nuts .